Hierdie handboek is nodig vir die vak Engels Gr 7. 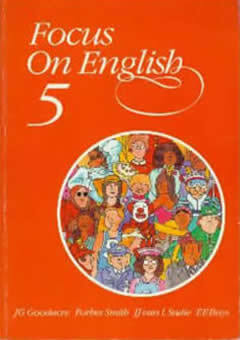 Titel: Focus on English 5 Skrywers: J G Goodacre, Forbes Smith, J J van L Sadie en E E Buys. Aantal hoofstukke: 19. Aantal bladsye: 202. Opgesomde inhoud: Each of the 19 units consists of a comprehension test, vocabulary exercises, a dictation, language explanations and exercises, oral and written work around the theme of the reading. Every unit focus on a specific languistic aspect, such as punctuation, sentences, nouns, verbs, the infinitive, subject and predicate, active and passive voice, pronouns, adjectives, adverb, conjunctions, prepositions, direct and reported speech, synonyms and antonyms, word order.